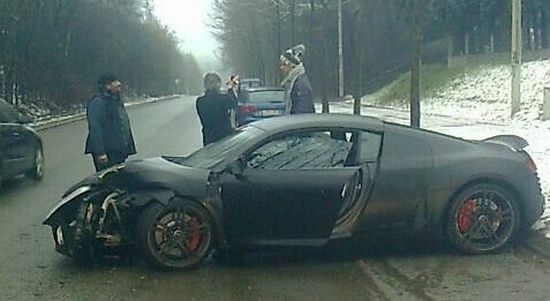 The belgian football player Guillaurme Gillet had a bad day with his matte black Audi R8 4.2. Around 9am on his way to the training centre in Neerpede, he has lost the control of the car with the result of a crash with many damages in the front of the car, but hopefully Gillet hasn't reported any injuries. The cause of the crash was certainly the low temperature of the tarmac, even with these conditions and cold tires, the legendary Quattro system can't do much.